I did not know what to expect when I agreed to review Thomas Nelson’s NKJV DELUXE READER’S BIBLE. Upon arrival my first impression was how elegant the box is that the Bible is in. I equated the box that my cell phone came in except the Bible simply slid out, no need to open. I chose the cloth bound copy with a yellow spine and what they are calling gray but I say is golden/ grayish front and back cover. It also has two place mark ribbons, I have learned that one is not enough. Like many of Thomas Nelson’s Bibles the font is easy to read; so-far, so-good. I have never read a “Readers Bible” before so it took a few minutes for me to adjust to the presentation of Scripture. I was not constantly reminded of what book I was reading, found in the header of the page on the left not on the opposite page. I had to look on the page to my left on the left column and the small red number to determine which chapter I was in and look in the folds for the numbers written in black to determine, generally speaking, which verse I was reading. The NKJV DELUXE READER’S BIBLE is as close as I have gotten to reading actual scrolls. This is a Bible to be read as a letter should be read. It is presented as a book should be written. 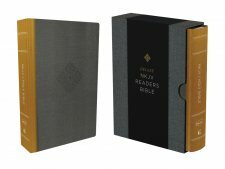 The NKJV DELUXE READER’S BIBLE is meant to be read, I would not use it as a Bible study tool, nor would I take it to church with me. (By the time you find Jeremiah chapter 10 verse 5 service would be over.) This is the Bible to get if you want to read Scripture from Genesis to Revelations non-stop without having to read footnotes, commentary or look at pictures- there are none.